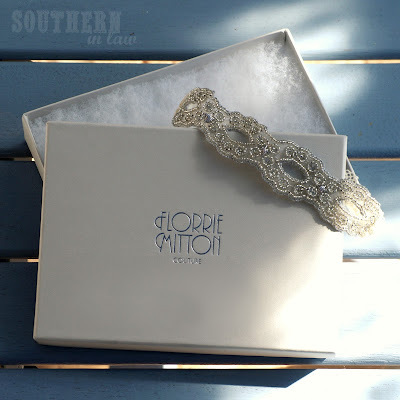 Southern In Law: Wedding: The Little Details - an Accessories Post! Wedding: The Little Details - an Accessories Post! We're just 57 days away from the big day and all of the little bits and pieces and final pieces are starting to come together. Today I'm talking wedding accessories - my shoes and the garter I have fallen in love with! Firstly, I want you to meet the prettiest garter in the world. Florrie Mitton Couture's Goddess Garter. Hilary Duff actually wore a Florrie Mitton Garter under her wedding dress - girl has good taste! This garter is exactly what I wanted. I didn't want your traditional garter as I thought they were a bit boring - and I wanted something that sat flat. 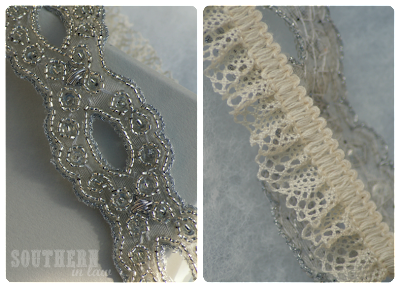 This garter has everything I wanted, a vintage style with some bling. 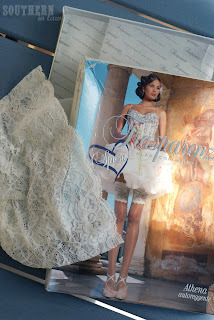 Another accessory that many brides are looking for are stockings - but why go for boring stocking when you could get something cute like these Trasparenze Athena Bridal Hold Ups from Sweet Pins. At $32 they're not an expensive accessory but will make you feel a million times cuter than regular stockings! Now for shoes. I'm quite tall and the same height as Jesse so heels were totally out of the question. What I needed was a pair of cute and comfy flats - and these Diana Ferrari Palana flats were perfect! This way I can wear them after the wedding too and they're not collecting dust in my wardrobe. Now, I ordered a size up than what I usually wear as I find Diana Ferrari shoes tend to run a little small and they fit perfectly. I got a 10 (I told you I'm tall - that also means I have flippers to hold me up ;P) and they're just the right size! If you buy from Diana Ferrari Online you'll see that they have a whole Bridal Section (many which are on sale) - and shipping is a flat rate of $9 or free for orders over $100! But tell me - heels or flats? Which do you prefer? I love heels but I tend to look a bit like a giant so I stick with flats - generally ballet flats, espadrilles, slip ons, cute sneakers and closed in shoes as I don't like feet - especially toes (I'm weird like that). Both companies did send Kristy these items as a gift, however, as always - all opinions are her own and she means everything she says. Beautiful choices! I am definitely a heels girl. Flats never fit me, they are always so wide and just slip right off! I often have the exact same problem - I have big feet, but thin feet so they often come too wide! That is a BEAUTIFUL garter that I have fallen in love with! 57 days? It's getting close now! I have the same problem with shoes. Big feet, and I'm the same height as my fiance so have already told him he needs to wear his shoes which have the most height on our wedding day next year! It is getting close - eek! But hopefully we will have EVERYTHING sorted very soon! Awesome dress inspiration today. I've always loved cheongsams, and that green one is the best I think I've ever seen.And congrats on feeling good with your weight loss!